33 million Colombians are eligible to vote for the lower and upper house of parliament tomorrow on Sunday (9 March 2014). The vote can be seen as a referendum on the ongoing peace talks with the “leftist” FARC guerrillas on Cuba but it will be an important trial run for the presidential vote on 25 May later this year. Unfortunately, also this year around the government cannot guarantee free and fair elections all over the country. 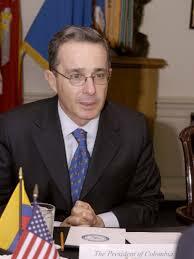 One of the main questions will be how well former president Álvaro Uribe will do for his race to the Senate. Uribe, a stern conservative, ran the country for eight years and the ICC at The Hague currently is studying a possible case against him as human rights groups claim that he is responsible for numerous human rights abuses during his time in power, including the extrajudicial killing of some 3,000 innocent civilians. However, Uribe was able to remain popular, particularly in his home region Antioquia where a lot of votes can be gained. People in favor of him argue that he brought back security and economic stability. His critics say that the means to achieve more security were not proportionate in costs and human lives; in addition, security has not returned to all corners of Colombia. Moreover, Colombia is one of the most unequal countries worldwide. Today, Uribe is an outspoken critic of Santos, his former defense minister, and is very much against the peace process in Havana and accuses Santos even of treason. Uribe founded a new party, the Democratic Center, and it is ironic that Uribe runs on the campaign slogan “No to impunity,” as it is him who is regarded by his critics as the person responsible for killings of innocent civilians. He refers, however, of course to the members of FARC that should not be granted impunity. Uribe is Colombia’s first ex-president to seek a seat in the Senate, from which he aims to challenge the course of the talks. Opinion polls expect between 15-25% for Uribe in the Senate election and see his party in the first place. While he would not have a majority in congress, it would still allow Uribe to be a powerful voice for a possible referendum of the outcome of the peace talks in Havana. Uribe has strong contacts to neo-paramilitary groups as well as criminal gangs (bacrims). The second strongest party will probably be the Liberals between 15-20%, they have been probably the only major party without internal fights in the election seasons about major posts. The Party of National Unity of President Santos only comes in third with some 10-15%, thus most likely it is going to lose significantly. Leftist parties are traditionally weak in Colombia in national elections – not a single time there has been a leftist majority in Congress or a leftist president in power – and it will not be different this year around. The left has failed to benefit from the peace talks and is split as ever. Moreover, leftist party are tainted by the right of supporting the armed struggle of leftist guerilla groups which seems to be a distortion as rightist political parties have links to (neo)paramilitary groups. For the first time since in the 1980s the Patriotic Union will be running for election again, they suffered a wave of murders back in the 1980s from rightist groups. While they were hopefuls back in the day, this time around they hardly seem to play a role. A particular interesting role plays the movement that calls for voto en blanco (blank vote) because they are frustrated with the parties that run for office and want to show their disapproval of current politics. They can expect some 20%, although it remains to be seen how many people will really vote blank, because during the last days before the election, many voters do decide otherwise and actually vote for a party. In contrast to many other countries, blank votes are valid votes as well as an incentive that people go to elections. However, this movement will favor, ironically, the big, established parties because it will be much harder for the small parties to actually make the 5% hurdle to get into parliament. Unfortunately, illegal groups continue to exercise pressure and intimidation on voters to keep them from voting in at least a fifth of the national territory. This year around it is down from 36% of communes in 2010 where people faced some kind of intimidation or threats, however such kind of data is frightening and clearly set up a failure of Santos who promised free and fair elections. Also a list of 35 candidates for Congress has been published that have contacts to illegal groups. Finally, there are reports that people offer to vote for any party when they gain in return some €50 for their vote. There are also new rules in place to improve transparency will be put into place, including biometric identification to fight voter fraud and immediate vote counting on election day. A victory for Uribe on Sunday would certainly be a big threat for the peace process in Havana because he will try even harder to undermine the prospect of an agreement that could bring the civil war of 60 years finally to an end. Even worse, 80% of the people who run for parliament, particularly from the right, have not shown where there finances for their election campaigns is coming from, which suggests that this money is coming from illegal groups. This suggests that it will also be much harder to sign a peace process when many future parliamentarians were financed by neo-paramilitaries. Thus, the elections tomorrow are a corner stone whether or not a peace process for this country will be feasible or not.